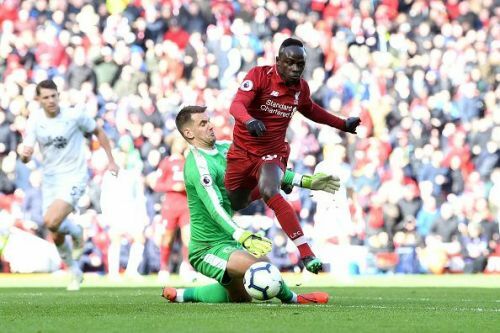 A brace each for Roberto Firmino and Sadio Mane saw Liverpool close the gap back to one point behind Premier League leaders Manchester City, after their 4-2 home win over Burnley on Sunday afternoon. The visitors raced into an early lead from an unfamiliar source as defensive midfielder Ashley Westwood scored his first Burnley goal - direct from a corner, with goalkeeper Alisson impeded inside the box. Match officials saw nothing wrong with the Brazilian's tussle for possession and the goal stood. Replays showed it shouldn't have, but this injustice only served as extra motivation for the Reds to respond quickly. 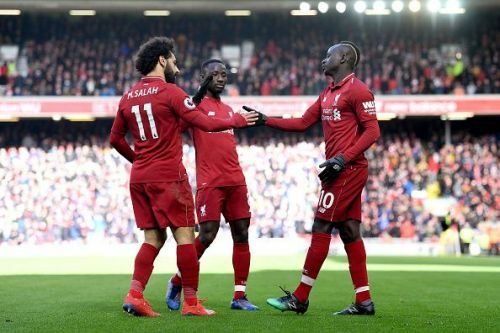 Two goals in ten minutes from Firmino and Mane gifted Jurgen Klopp's men a 2-1 lead at the interval and despite a late scare through substitute Johann Gudmundsson, the hosts ultimately came through unscathed as the pair completed their braces after the break. The cameras subtly panning to Joe Hart on the substitutes' bench was a welcome reminder - if Tom Heaton ever needed one: his starting berth is not a guarantee. After all, the 32-year-old has started all of their league fixtures since a 2-0 win against West Ham on December 30. His inclusion saw a surge in results for Burnley, which is no coincidence, but three successive defeats present a worrying sign with must-win fixtures ahead. It's made especially tough considering he was at fault for one of the four goals conceded and should've done better in the build-up to Firmino's first strike of the afternoon. In different circumstances, they draw that game 2-2 and earn a valuable point. That's something that Dyche, Heaton and Hart himself will be aware of. The latter enjoyed similar success when called upon early this campaign before a winless run and plethora of goals conceded saw him lose his place. He'll be hungry to earn it back with goalkeeping displays like these sure to give him confidence.